That's how it all was....kinda like this dreamy, gauzy day that moved in slow motion. Every time Julia began to dance it was like watching air begin to take shape. It floated right along side her and it was like a daydream. I swear it. Of course, Julia being a Principal dancer with the Pittsburgh Ballet Theatre certainly helped for this all to come together (soon to retire from her 17-year career as a ballerina this October....how incredible). 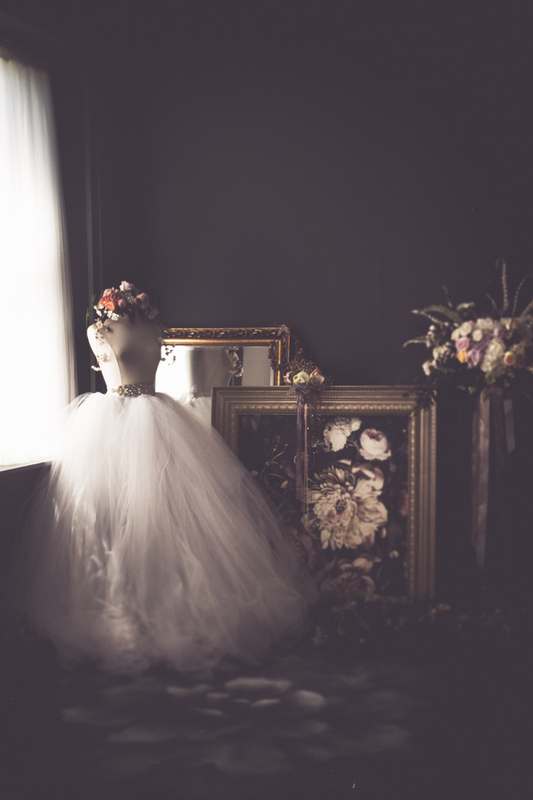 I wanted this shoot to be so whimsical, sort of like watching an old movie through a sheer curtain. There was so much romance to this day. It just overflowed with it and I truly didn't have to work that much at all. I think getting the concept narrowed down was the hardest part (and keeping the wardrobe changes to a realistic minimum....always my greatest challenge). Yes, that's a backdrop on the floor. Why not?? This is a daydream, after all. Yes, that's framed wallpaper, generously lent to me by the wonderful JPC Event Group. Yes, those florals are simply divine, the designs conjured up by the ever-so-dreamy-herself, Carmel, of Mt. Lebanon Floral. And that hair and makeup...so obviously Lee Ann, of At Home Beauty. This is what happens when a dream team comes together to create a daydream.